Preheat the oven to 400°. Place 2 slabs of ribs, meaty side up, on each of 6 large broiler pans. Mix the sugar with 1 tablespoon of salt and sprinkle on both sides of the ribs; fold the ends under if necessary. Cover the pans tightly with foil. Set 1 pan of ribs on each rack in your oven (refrigerate the rest) and roast for 10 minutes. Reduce the oven temperature to 325° and roast for 1 1/2 hours longer. In a large bowl, whisk all the remaining ingredients together with 4 teaspoons of salt. Uncover the ribs and turn them boney side up. Brush 1 cup of the sauce over the ribs and bake, uncovered, for 30 minutes. Turn the ribs meaty side up and brush with another 1 1/2 cups of the sauce. Bake for about 1 1/2 hours longer, or until very tender; rotate the pans and baste once with about 1/2 cup of the sauce halfway through. Remove the ribs from the oven and lightly coat them with more sauce. Return the oven temperature to 400° and repeat with the remaining ribs and sauce. Reheat the ribs if desired. To serve, cut between the ribs, then transfer them to a warmed large platter. Pour any remaining sauce into a bowl and serve on the side. If you have 2 ovens with 3 racks each, by all means roast all of the ribs at once. 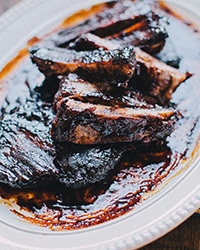 The molasses glaze suggests a beer that won't get lost between bites.